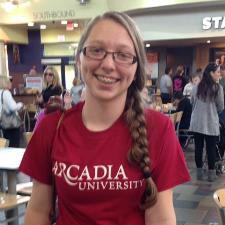 I am currently a Math major at Arcadia University with a minor in Secondary Education. I am planning to become a high school math teacher and wish to become a tutor for more experience. I am also planning to become a tutor at my school for my peers next semester. I was a tutor at my high school for two years and helped with a variety of subjects, not limited to only math. I also am known to help friends study or understand homework materials if needed. I have wanted to become a teacher since I was a little girl because my mom was a teacher for twenty-two years, and I want to follow in her footsteps. I grew up in her various classrooms, helping her decorate and lesson plan year-round. I hope to become as inspirational as she was to me, and I hope to help as many students as I can to grow and learn in safe, nurturing environments. Personally, I see teaching as a very rewarding profession, because I get the chance to encourage children, and help them to gain confidence in themselves and in their abilities. I have had experience tutoring alongside my mom for various grade levels. I have also helped a few students outside of school in middle school and high school grades. I try my best to incorporate various ways of thinking in order to find what best works for the student. I have also been very successful in explaining difficult concepts to people who were previously unable to grasp them. My favorite subjects to teach are currently Pre-Algebra, Algebra, Geometry, and Calculus. Please feel free to contact me with any questions or concerns! I am looking to improve, just as much as I am looking to help others improve and feel more confident in their abilities! Thank you for taking the time to look through my profile, and I look forward to hearing from you! I participated in a peer tutoring group for 2 years in high school in which I helped tutor a variety of grade levels and skill sets, and I also helped my friends during school with homework or class work they did not understand. I have also tutored two other students in algebra 1. Pre-algebra has been one of my favorite math subjects since I took it in 7th grade. I have helped some of my younger friends through their classes, and I helped my classmates while we were taking it. Annabelle was a wonderful tutor. She is smart and able to communicate very well. She is a very good teacher and we are very appreciative of her efforts. She was an awesome tudor. Annabelle worked with my daughter. She was very helpful.